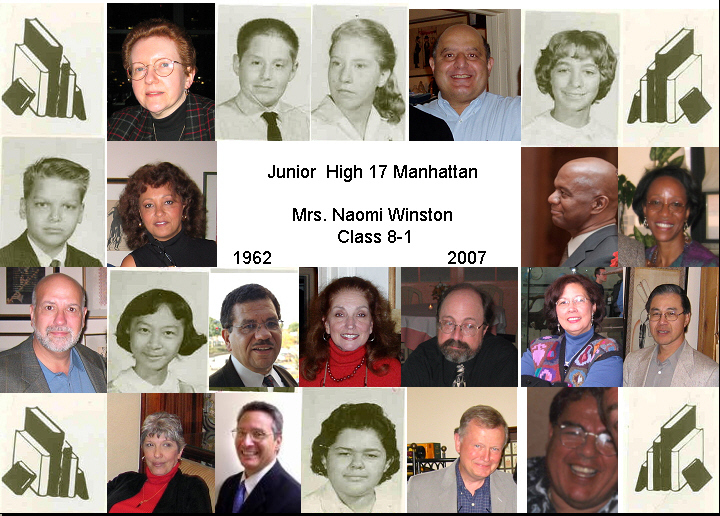 In the fall of 1960 a group of kids were assembled at LaSalle JHS 17 (47th- 48th street between 8th and 9th) as class 7-1. Most of them would be together for the next 3 years. Although this is a relatively short period of time, the memories of these days are strong in all of us. 10 of us had been together at PS-51 (44th-45th street between 10th and 11th) since kindergarten. While at LaSalle we went to class together, we partied together and we hung together in the neighborhood. In those days the neighborhood was known as Hell's Kitchen. This was a tough neighborhood in those days, nothing like the gentrified "Clinton" area it has become in recent years. A lot of time was spent covering each other's backs and avoiding people who liked to fight. 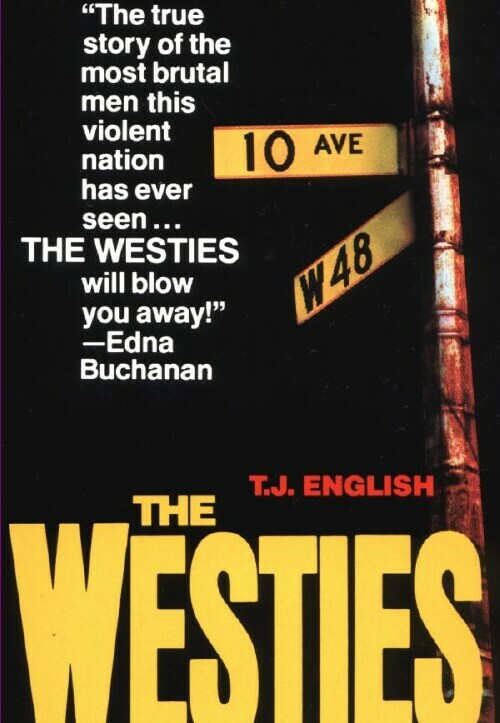 The essence of the neighborhood in the 70's was captured by T.J. English in his book "The Westies" which depicted the rampant crime propagated by the Irish mob of that time. 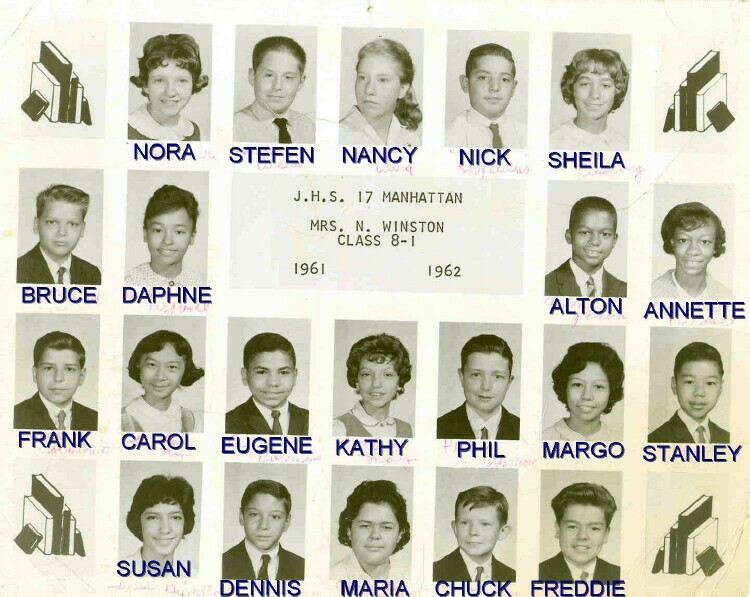 In fact, reputed Westie, Mickey Featherstone, himself attended PS 51 with many of us and can be found in our kindergarten picture ( bottom row extreme right ) [see PS 51 picture section ] Our copy of this photo was used by the History Channel a few years ago in their documentary on the Westies. 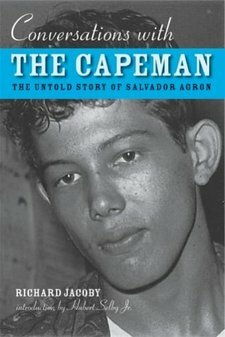 The infamous "Capeman murders” were also a part of our neighborhood's history. They took place in 45th Street Park (currently Matthews May playground) in 1959 when we were all 11-12 years old. The concrete playground was just a few doors down from Kathy's apartment building. In 1998, Paul Simon brought a play to Broadway based on this infamous episode in Hell's Kitchen history. In August of 1959, a teenage gang from the upper West Side called the Vampires, went searching for the Norsemen, an Irish gang from Hell's Kitchen. They came upon a group of teenagers in the 45th Street Park who weren't affiliated with the Norseman or any other gang, but happened to be in the wrong place at the wrong time. During the ensuing battle, 16-year old Salvador Agron stabbed to death two of these innocent bystanders and fled. He was described by the other kids in the park as a tall Puerto Rican kid, wearing a black cape - hence the name "The Capeman." When graduation time came, we all dispersed into the NYC High School system, attending Bronx Science, Brooklyn Tech, Music and Art, Fashion and Design, Performing Arts, Julia Richmond, etc. As the years passed, our families moved out of the neighborhood. Slowly we all lost touch. We lived our lives, had our own families, and then as we reached our 50's an alignment of the stars allowed us to meet up with each other again (we are the children of The Age of Aquarius after all !). To our surprise, the strong feelings we all had for each other in the old days quickly came back. Our group is best represented by our class 8-1 photo (see below). Just 21 kids in an urban, inner city (as inner city as one can get) junior high - well, not quite. We would learn more about how and why we got together some 40+ years later. Socio-economically, we were all lower middle class with only a few of the families close to being true middle class of the time. Religously, we covered Catholic, Protestant and Jew. Ethnically, we descended from white European, African, Chinese and Puerto Rican backgrounds. None of this mattered to any of us for these were our Wonder Years!